A particularly unique member of the mint family, Shiso comes in both green and red shades. Shiso is a warming plant yet not spicy and therefore great at gently warming those who tend to be cold. In Chinese medicine shiso is said to warm the stomach and spleen, seen as an aid to digestion. It is also considered a tonic for the lung. Shiso moves energy and the lymphatic system making it ideal as a part of a preventive formula as a cold is coming on. Containing lots of volatile oils, shiso has a unique herbaceous and citrus flavor and makes a great tea and spice for cooking. Shiso can be enjoyed as a tea or as a spice with sushi, fish, meat, vegetables or anything you can imagine! Play around and explore. Around the farm, it’s no secret that shiso is one of my favorite herbs. As a member of the mint family, it has a flavor that is not quite basil, not quite mint but is equally pungent and delicious. I first learned of shiso when I was working as an apprentice sushi chef and we used shiso in several sushi rolls and as an accompaniment to sashimi. 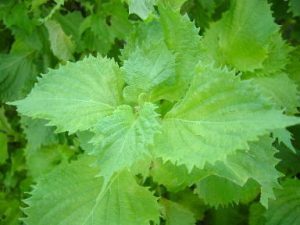 Since then, I’ve learned that shiso is used in Japanese, Korean and Chinese cooking, and is especially valued for accompanying raw fish in part because of its antibacterial properties. Here is a pesto recipe that is great with soba noodles and sesame oil or with any dish you might normally want pesto for. I grow both red and green varieties – either are fine for culinary use. In a food processor add 1/2 cup oil (extra virgin olive oil, sunflower seed oil or sesame oil), 3-4 cloves peeled garlic, 1/4 cup nuts (walnuts, pumpkin seeds or pine nuts – you can soak them overnight if you like), 1 teaspoon salt and 1 teaspoon black pepper. Blend well. Gradually add handfuls of shiso, parsley, arugula, dandelion greens, oregano or sage until you get a consistency you like. If its too thick, add more oil. Adjust salt and pepper to taste. Wash shiso leaves (a large bunch of red or green, enough to loosely stack 2-3 inches high) and remove stems. Stack the leaves, putting a layer of sea salt in between every other leaf. Put the leaves into a glass bowl with just enough water to cover. Leave for several hours or overnight. Drain leaves. In a separate bowl, mix the rest of the ingredients (2 teaspoons fermented shrimp paste, 2 teaspoon fish sauce, 2 teaspoon korean chili paste, 3 cloves minced garlic and 1 inch ginger root) together until you get a loose paste. Using a butter knife, spread a little bit of the paste in between every other leaf, until all the chili paste is used up. Fold up the whole stack and place into a clean, sterile jar. Add pure water until the leaves are covered, then close the jar loosely. Leave in a cool, dark place to ferment. This takes about a week. Unless you are using an air-lock jar you should check the lid every day to see if any fermentation gas needs to escape. Serve a small plate of the leaves to be eaten as a side dish, mince the leaves into vegetables or salads for a spicy mix, or eat your fermented shiso by wrapping a leaf up with some lettuce and bulgogi (korean bbq). For some more ideas on recipes with shiso look here.